Here we are, in 2018, with a new Sword Art Online anime series, this time about a woman playing as a loli avatar in a VR battle royale game. It’s not wholly bad, but like its predecessor, it fails to live up to its intriguing premise so far. Definitely not plucked out of a trash bucket of Google search-optimized otaku terms, Sword Art Online Alternative: Gun Gale Online follows college student Karen Kohiruimaki’s foray into a virtual world created in the aftermath of the original (and fatal) Sword Art Online MMORPG. This time, it’s ostensibly safe. The VR devices of the past have been recalled, and, in the year 2026, apparently with all forgotten, VR experiences a resurgence in popularity. Gun Gale Online, the game within the anime, is the VR PlayerUnknown’s Battlegrounds of the future, in which the last team of gunmen standing wins. Karen, who is very tall in real life, is convinced to try out the survival shooter because it’s the only game that lets her be short and cute. 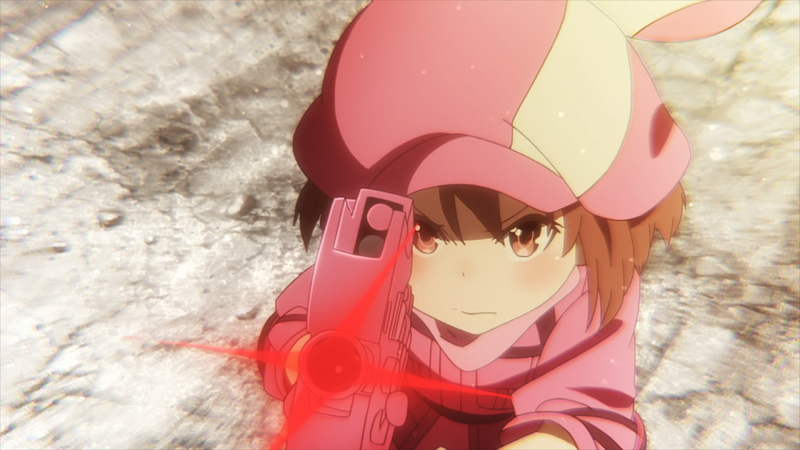 With a bright pink uniform and a bright pink submachine gun she calls P-chan, Karen becomes the hyper-dextrous shooter Llenn. This is a game I wish existed in real life. It’s got RPG elements, like roaming mobs in an open world and pubs for players to relax in. It’s also decidedly battle royale, with a good twist: Every few minutes, scanners carried by the players reveal everybody’s location. That gets things going and makes hiding less of an option. I’m appreciative of these variations, since an anime actually replicating PlayerUnknown’s Battlegrounds might be 23 minutes of watching someone lie prone in a dirty bathroom. The design of Gun Gale’s gameplay is poised to create lots of suspense, and it would if not for the poor storytelling habits that this show inherited from the original Sword Art Online. Mid-action, characters are explaining the game’s rules. Mentor figures introduce random, game-changing ideas in crucial moments, which always just feel like dei ex machina. The characters don’t even feel self-consistent. Karen, for example, vacillates between hyper-incompetent and hyper-competent in a matter of minutes. All the sudden, after never playing a VR game, she’s the “pink devil.” Okay, Gun Gale, seems legit. Karen’s character motivations suffer from a stunning lack of creativity: She’s self-conscious about her height, so she becomes a master VR gunslinger? Still, seven episodes in, Gun Gale Online has treated its female characters decidedly better than the anime’s earliest iteration. Women get each other into Gun Gale. Women dominate Gun Gale. Women watch Gun Gale. There isn’t an excess of unnecessary breast physics or senseless groping—thankfully, since Karen’s avatar appears to be about ten. Whenever the original Sword Art Online is brought up, one of the big criticisms I hear is that, despite its promise, it’s a bad shonen anime but a good harem anime if you’re into that. Gun Gale could be an excellent show where a girl who doesn’t feel comfortable with real-world beauty standards forges deep and gratifying relationships with gamers’ avatars in a virtual world. It could be a show where we watch Karen struggle over time to hone her battle royale skills and, in the process, learn the confidence she needs to succeed in real life. Instead, it’s just more blah anime about video games we wish existed.